When you look at the Oregon football team what do you see? You see the uniforms and the high-speed offense; you see the flash. You don’t see what defensive coordinator Don Pellum sees; you probably don’t pay much attention to the defensive side of the ball at all. 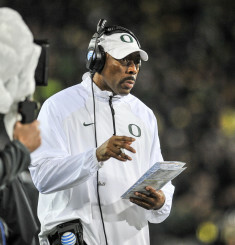 The Ducks operate a bend-but-don’t-break defensive scheme. If the offense is operating at usual efficiency, the defense only needs to get a few stops to put the opponent down by two or three scores – and playing catch up against the Ducks is almost impossible. What Oregon does a great job at, is making adjustments, and these could come during the game in terms of on-field personnel, alignments and play calling. But after the game is over, and the Ducks hit the practice field, the real adjustments begin. 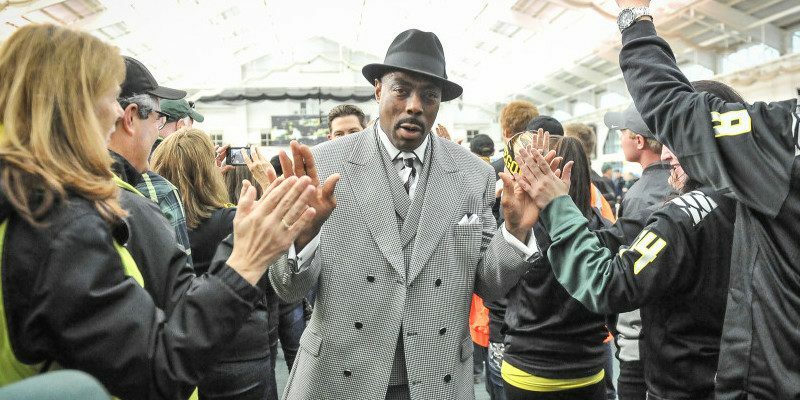 Wednesday, Don Pellum talked with the Pac-12 blog about how his defense performed last season, his first as defensive coordinator. Chantel Jennings of ESPN reported the interview. The Oregon defense had its best game in the Pac-12 Championship game against Arizona, holding the Wildcats to only 224 total yards. I will admit, we were somewhat exposed against Ohio State in the national title game. The counter “wham/trap” play the Buckeyes ran dominated our defense for the majority of the game. But now it’s on film, which means the defense can review it and make those key adjustments to get prepared for next year. Mark Helfrich was a much better coach in his second year than his first year, mostly due to being more comfortable in his role as the leader of the program. Next year will be Pellum’s second year as the defensive coordinator; he will be even more comfortable leading film sessions, leading practices, and making those key adjustments we were so good at last year. Not to mention he is a great recruiter, landing guys like five star defensive lineman Canton Kaumatule and big hitter Fotu Leiato with personal visits during this recruiting season. As Pellum improves, so will the defense overall. 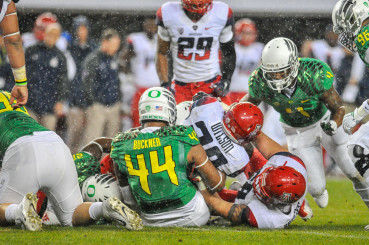 The Ducks will likely have another high-octane offense in 2015, but how will the defense look? With key personnel losses including Arik Armstead, Ifo Ekpre-Olomu, Troy Hill, Tony Washington, Erick Dargan and Derrick Malone, many fans won’t be expecting much from the defensive unit; but what else is new? Our defense benefits from our offense, there is no doubt about it, but if we get in the weight room and get bigger like we did last offseason and Pellum continues to make strides as the leader of the defensive unit, our offense might not be the only force next year.